Without doubt, it sounds wonderfully romantic. 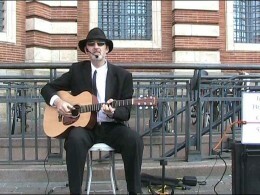 Picture the scene, for a moment - the blues guitar man performing on the streets just like in the old days in the States. Let's see what its really like and also find out a little about how to go about starting this old, old profession. 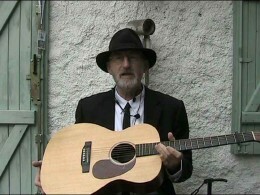 Jim Bruce tells us something about his chosen career as street blues guitarist in the South of France . What tools do you need to have to entertain people on the street? Everything we need to know follows below - the clothes, guitar, amplification, locations to perform, general advice and the vital component - bad attitude! I remember reading about the performers who rambled around playing blues guitar on street corners and parking spaces close to tobacco houses in order to try and make enough to eat. They also played at parties and bars, where mostly their remuneration was meal, something to drink and a bed just for the night. It was inevitable that, as they moved around from town to town, their techniques improved and evolved according to the preferences of their audiences. 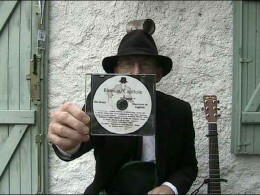 A blues man on the street was at best something to distract people from a tough , grey way of living and at worst, a bum or a beggar, who should be ignored or treated badly . Do Your Clothes Have An Impact? the best it can be. Quite the reverse, the music needs to be the highest quality, so that people are pleased by the feeling. his gives respect to your audience. Additionally helps a lot if you are a little different from the rest of the crowd. I favor a black suit, white shirt, thin black tie finished off with a wide brimmed black hat. This way of presenting myself is like the old sepia record company photos of classic blues men, and is also a little different in today's world. Give yourself a name (possibly invent an alter ego) and write your new name on a poster displayed on your amp, for example . Guitar (duuuh!) - Something To Sit On - Amp and mic - Guitar tuner - Trolley - Cool Sunglasses! too heavy and large. I now favour a microphone attached to my head, which costs around $50 for a reasonable sound . My current amplifier is a 30 watt job bought from Thomann. It has a rechargable battery inside and it takes around six hours to recharge, which allows a playing time (both channels ) of between 6 to 8 hours, depending on how loud you play and sing. It's quite heavy at 10 kilos, hence my little trolley. Channel one has simple tone and volume controls - this is for the voice, and the other channel features volume, gain, low, medium, and high gain controls. This 2nd channel is ideal for balancing the string sounds of an acoustic guitar. The cost is excellent value at $120. Keep in mind whereabouts you will be using your guitar. Ask yourself - could it be knocked? It's very possible! Could it get stolen? These things happen - all is possible. One time I mislaid a favourite guitar on the subway by mistake, as I was feeling sleep and distracted. It goes without saying that I never saw it again. By luck, it's easy to purchase a perfectly good guitar nowadays without it costing an arm and a leg. For some time I played a Vintage parlor guitar, complete with integral Shadow equalizer and tuner unit, which cost around $200! My present street guitar is a Martin 000X1AE, which uses a braided strip bug under the saddle and volume/tone controls inside the sound hole. The spruce top is not varnished (or hardly at all ) and could be quite prone to marking, but the neck, and rest of the construction is some kind of man made material - not wood at all! Martin don't say what it is, but do say that it's not plastic or a wood pulp derivative. No matter what it is, it's very resistant. I've banged it many times without any evidence of the contact. I carry it in a soft carrying case strapped to my back. Where Are The Good Places To Play? This is a tough one, as it depends on your city. Let me tell you how I do it. First of all , if you see a musicians performing outdoors, then it's safe to assume that it's at least accepted by the police. After that, there's nothing left to do except try it out! I move about a a fair bit and watch people when theycross intersections, etc, or move through a pedestrian shopping precinct. It helps a lot if people can stand around without impeding the natural flow of other pedestrians, or motor traffic . 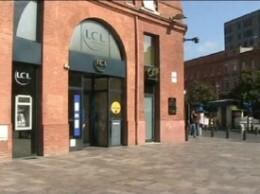 I often perform close to markets in the city centre - this is an ideal spot for a street blues man . You will get some funny looks when preparing to play, as folks are really curious. It may take a little gumption when you first start to do it, but gets easier each time. It's better if you take an attitude to your activity. When setting up, I'm generally smiling and chatting to people and try to give the impression that I should be there. It's my street, it's where I make my living and I have every right to go there. Of course, you don't have any right to be there at all, but if you play OK, and not oppressively loud, the police will (probably ) let you stay, as it brings a little interest to the general ambiance. Start with a song that's simple and attractive - it won't help your cause if you try and perform to your maximum ability and make a mess of it! Play to seventy five per cent of your capabilities until you get into it. In that way, your playing will be sure . Is It Possible To Make Good Money? Living from playing blues guitar is always tricky and can only be managed by earning relatively small amounts from several similar activities. In my case , street performance has really played a significant role . That said, playing on the street just for tips will not make much. You need to offer something else, like a CD at a really good price. This often doubles the amount earned with street performances. 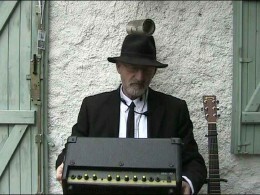 Some of my other activities include live gigs and guitar tuition, and I get many contacts from my street playing. Sometimes people ask me about blues guitar lessons and some others offer me gigs at functions, parties and in their bars and cafes. I'm happy to say that blues music is the way I make my living .